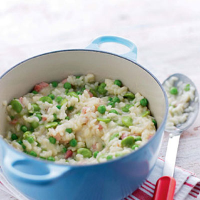 Add the beans and peas to a pan of simmering water and cook for 3–4 minutes until just al dente. Drain, reserving the water. Use this water and stock cube to make up 1.2 litres of stock, and keep simmering in a pan. Put the shallots and pancetta in a medium non-stick pan. Cook over a medium heat for 3 minutes until soft and golden. Add the rice and stir for 1 minute, followed by the wine. Gradually add the stock (a ladleful at a time) and keep stirring until each amount is absorbed. This will take 15–20 minutes. When the rice is almost tender add the cooked beans and peas and cook for a further couple of minutes to heat through. Stir in the cheese and butter off the heat and season to taste. Serve on warmed serving plates. This recipe was first published in Wed Jul 01 01:00:00 BST 2009.